[by Sora Ghim] Daniel transformed into a guide during the Italy trip. Arriving in Italy, the seven friends traveled to the historical and culturally filled Tuscany. Zhang Yuan stated, “All my friend’s home are in the country,” showing his disappointment on not seeing great cities like Rome and Milan. 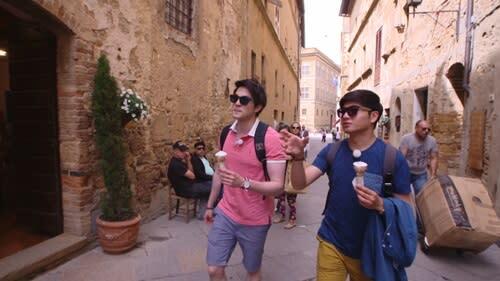 However, on seeing the beauty of Tuscany, Zhang Yuan was amazed at the scenery and acted as if he never said those words. The representative city of the Renaissance and a UNESCO World Heritage site, Daniel took charge as the guide in Pienza. Studying fiercely about Italy on the plane, Daniel and the prepared Mark transformed into guides. Without rest, Daniel relayed information on the history of Italy to the friends.